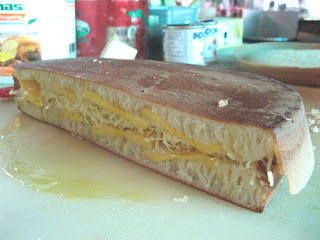 I have been eating "martabak manis" (sweet thick pancake) since my childhood time. 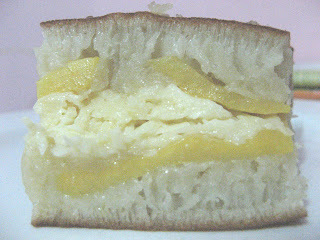 Martabak manis is a snack favored by many Indonesians. It is a sweet pancake made from flour, egg, coconut milk, sugar, yeast and baking soda topped with you choices of chocolate sprinkles, shredded cheddar cheese, corned beef, sweet kernel corn, jackfruit slices, banana slices, etc. 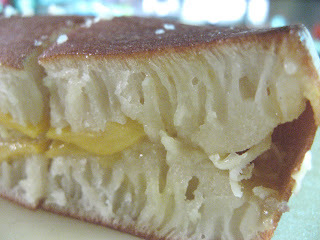 The martabak is crisp around the edges, the flesh texture was soft and moist, almost cake like. It comes in the the size of a medium pizza pan. 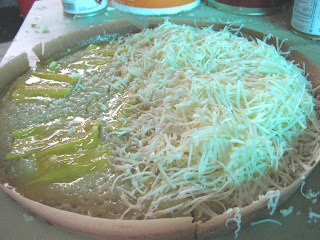 My favorite is Martabak Manis with jackfruit and grated cheddar cheese fillings. They first smother it with butter and than it is filled with the filling of your choice. Then they cut the pancake in half and close the pancake on top of each other. It's so delicious and rich dessert..truly a heavenly delight. For one whole plate it only costs me about Rp. 30,000 or USD 3.40 and that can be cut up to 14 pieces. Enough for 3 to 4 people to enjoy! Oh yes, martabak are made for to-go orders only. Normally people buy 1 whole plate and share them with the family at home. 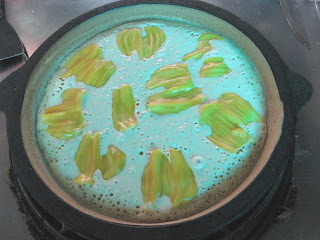 Pour in the yeast into the warm coconut milk, stir until well mixed and foamed up, set aside. Mix flour and sugar, then pour in the eggs in the middle of the batter. Keep stirring the mixture until all ingredients are well dissolved. Then put in the baking soda and stir the mixture again until well mixed. Set it aside in a room temperature for approximately 15-20 minutes. Heat up the non-stick pan that has been smeared with butter/margarine. Pour the mixture in and let it cook until the surface dried up and the outer layer become crispy brown. Pour granulated sugar on the crepes as well as the condensed milk. Up to your liking, you can pour grated cheese, grated fried nuts, chocolate sprinkler or sesame seeds on the crepe. You can also combine the filling. Fold the crepe in to two then cut the crepe into 10-12 pieces. Linds with Mr. Hippo when she was 2 years old.Well, this has been a long weekend! I do not think this weekend could have been any better! I have some light stories to share from my recent trip to Singapore. It is about my 11 y/o niece, Lindsey. Despite my busy schedule at Expo I managed to spend some time with her and my sister so that we could all really talk and really listen to each other. As a single parent, my sis is sometimes struggling with what to do. When Linds still a toddler, everything is new and breathlessly anticipated, so the changes are not dramatic. But now while my sis was busy with the day to day business of life, her daughter is fast growing. Linds is only 11 years old but she is now almost catching up my height (5 ft 2 inches) and her shoes is 2 size bigger than mine. When she is being a bad girl, Linds likes to spend her time in front of the computer playing game or watching her favorite cartoon movies for hours. It is difficult to ask her to go bed early. But some other days she is just a sweet mommy's little girl who likes to play with her dolls. Linds also loves to give her mom hugs and kisses like she's never gonna see her again. She wrote several "I love you mommy" in a tiny little note that she sticked in the computer, bedroom door and the books drawer. Overall, it gives my sis some crazy days to look forward to with her own little critter ... LOL! The truth is that it doesn't get any easier to raise the kid alone but the fun is that they learn together. And the best way to do that is to keep the lines of communication open. Hope everyone has a great long weekend. Take care out there! Hello all! ... a quick note here before you all think I have slipped into the black hole and disappeared forever! Well, life has been so busy that it seems I hardly have time to do much of anything. Expo, family matter and works have taken precedent over the internet blogging. I think I just needed to utilise my time as efficiently as possible so that paperworks dont pile up unnecessarily. I know my ramblings as of late have been just that...ramblings of a grumpy old woman :) Truth be told I am really clueless to my cough problem. I have had a cough for about two weeks now. It got a bit better when I was in Singapore but on the last day of Expo I think I inhaled a lot of dusts when I helped packing the goods. I don't know what is causing the cough. It may be a foreign particle in the lung that I got after the flood, or could it be an infection??? I probably need to see a Pulmonologist as the meds from the doctor before I left for Singapore didn't work at all.